If you've been following the news around Android and upcoming devices it's probably no suprise, but now it's official. 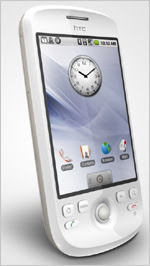 HTC Announces that the HTC Magic will be the first Android device to hit the shelves in Sweden. Rumors have been flying around that it would show up as early as May, but there's no official date yet. HTC have a new site up at http://www.htc-magic.se/. Apparently a press release has gone out announcing that the HTC Magic will be the first Android device available in Sweden. IDG.se has a brief article about it aswell. The price is said to be around 4800 SEK which is about the same amount it costs to import a ADP1 device (G1 - dev phone).